Scrivener is a rich text, images, PDF, audio, video, web pages, etc.). Scrivener offers templates for screenplays, fiction, and non-fiction manuscripts. After writing a text, the user may export it for final formatting to a standard word processor, screenwriting software, desktop publishing software, or TeX. Features include a corkboard, the ability to rearrange files by dragging-and-dropping virtual index cards on the corkboard, an outliner, a split screen mode that enables users to edit several documents at once, a full-screen mode, the ability to export text into multiple document formats (including popular e-book formats like EPUB and Mobipocket for Kindle, and markup languages such as Fountain, HTML, and MultiMarkdown), the ability to assign multiple keywords (and other metadata) to parts of a text and to sort the parts by keyword (such as characters, locations, themes, narrative lines, etc. ), hyperlinks between parts of a text, and "snapshots" (the ability to save a copy of a particular document prior to any drastic changes). Scrivener allows photos, URLs, and multiple other file formats, to be dragged into its interface as well. Because of its breadth of interfaces and features, it has positioned itself not only as a word processor, but as a project management tool for writers, and includes many user-interface features that resemble Xcode, Apple's integrated development environment (IDE). One computer programmer has called Scrivener "an IDE for writing". Keith Blount created, and continues to maintain, the program as a tool to help him write the "big novel", allowing him to keep track of ideas and research. It is built mostly on libraries and features of Mac OS X from version 10.4 onward. In 2011, a Windows version of the software was released, written and maintained by Lee Powell. There is no official release date for iOS (iPad). There is no official release for Linux, but there is a public beta version. The latest version of Scrivener for Mac OS X is version 2.7. The direct sale version can be installed on Macs running Mac OS X Snow Leopard (OS X 10.6) or later. The same version can be obtained from the Mac App Store, but since the Mac App Store application is only usable on OS X 10.6.6 and later, users of earlier versions of OS X must buy it directly. 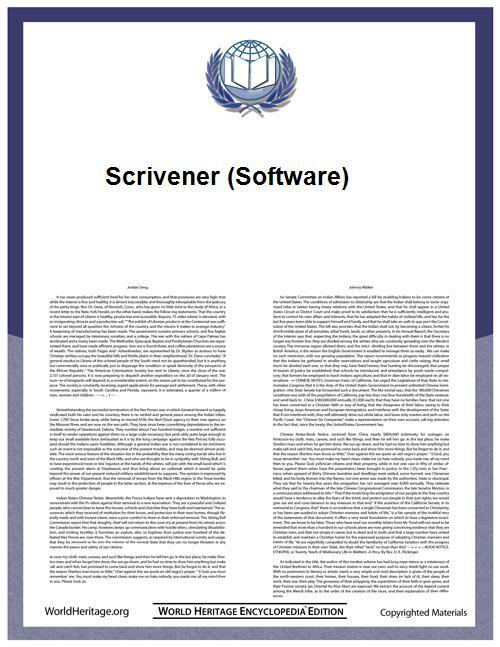 The company also makes Scrivener 2.5 available for earlier version of OS X, but claims it is "the final version of the software that was built to run on PPC or Intel systems running OS X 10.4 or 10.5." This version is available on the direct sale page in the sidebar titled "Mac OS X 10.4–5 and PowerPC". In addition to the Scrivener version 2 releases, the direct download page provides access to the obsolete version 1.54, but licenses are no longer available for purchase. The 1.54 release is compatible with Mac OS X versions 10.4 through 10.6. The latest version of Scrivener for Windows is 1.9. It is compatible with Windows XP, Windows Vista, Windows 7, Windows 8, and Windows 8.1. ^ a b "Change List: Scrivener Mac OS X". literatureandlatte.com. Retrieved 2 October 2015. ^ a b "Change List: Scrivener for Microsoft Windows". literatureandlatte.com. Retrieved 13 April 2015. ^ a b "Scrivener 1.7.2.3 Linux beta released 22nd July 2014". literatureandlatte.com. Retrieved 17 August 2014. ^ Bailey, Dan (24 January 2013). "Writing as programming". danbailey.net. Archived from the original on 2 October 2015. Retrieved 2 October 2015. ^ Watt, Justin (2012). "Keith Blount, founder and lead developer at Literature & Latte". objectivesee.com. Archived from the original on 2 February 2012. Retrieved 2 October 2015. ^ "About - Clever Dictionary". cleverdictionary.com. Archived from the original on 26 November 2014. Retrieved 2 October 2015. ^ a b c "Scrivener for Mac OS X Download". literatureandlatte.com. Retrieved 2 October 2015. "Developer Spotlight: Literature and Latte". Turnball, Giles (February 2007). "Keith Blount's Scrivener".